3. FORM: Predictive or Repressive? 6. Does Science Ask the Right Questions? Welcome to Issue 23 of SHAPE Journal. 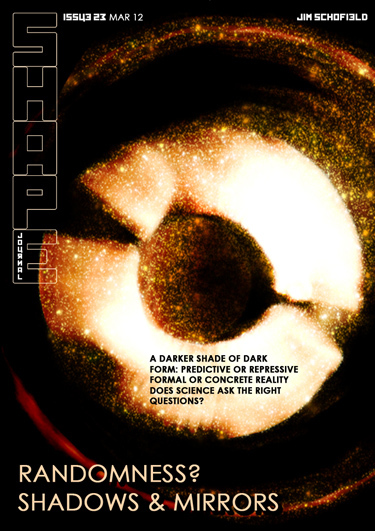 This issue of SHAPE Journal reflects yet another turn in the nature of a standard Issue of the Journal. Both the Journal and its Blog have developed considerably since we originally conceived of them almost 3 years ago. In particular the instalments of extended papers over a series of Issues has proved to be less than ideal, and we had to institute Special Issues, wherein a topic was more comprehensively addressed by a series of complete papers all-in-one-issue. But, though highly successful that didn’t solve the problem of the so-called Standard Issue, so various alternatives have been considered at length. Today’s Issue will test out a different form for such Issues, in that it gathers together in one Issue a collection of short articles and even reviews, which when taken as a set (though certainly not designed as such), reflect better our general and, we believe, unique approach. Many of these kind of papers have been published separately on the Blog in the past, and that will still continue in the future. But, we felt it to be essential to not only publicize the Journal on the Blog, but also vice versa. This short collection does have a common basis and demonstrates it, though they were written at different times for individual purposes. They demonstrate our general approach and its concern with philosophy and method in many spheres of Human activity. In yet another deviation from our standard practice, this issue has been published as a single PDF, something we have been doing with our Special Issues for some time. Let us know what you think of this change. The Blog, meanwhile continues with its series on Socialism, and advertises an upcoming Special on Christopher Caudwell’s The Crisis in Physics.